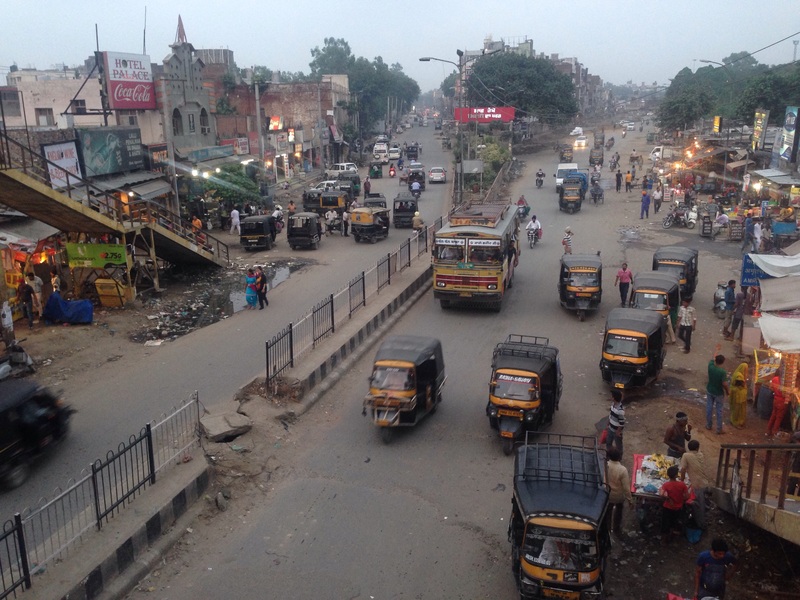 Today was to be our 3rd day stopping in New Delhi with my bike being serviced today (hopefully tyres will arrive) and Steve will aim to strap himself in the rental car and let the driver do his thing so he can go back up town for a 3rd day running to collect the visa’s. I pleased that my bike servicing went well with no additional work required, however I was still awaiting the arrival of the tyres and the week was running out as it was a Thursday already. Fortunately I had now been sent the consignment details for the tyre shipment so we were now able to chase up the delivery at this end. The great news was that Steve collected the visa’s without any hassle. We were both looking forward to visiting Myanmar however the visit process when arriving overland was more difficult as the application date was time critical and had to be done in person rather than a simple prior to our original departure. 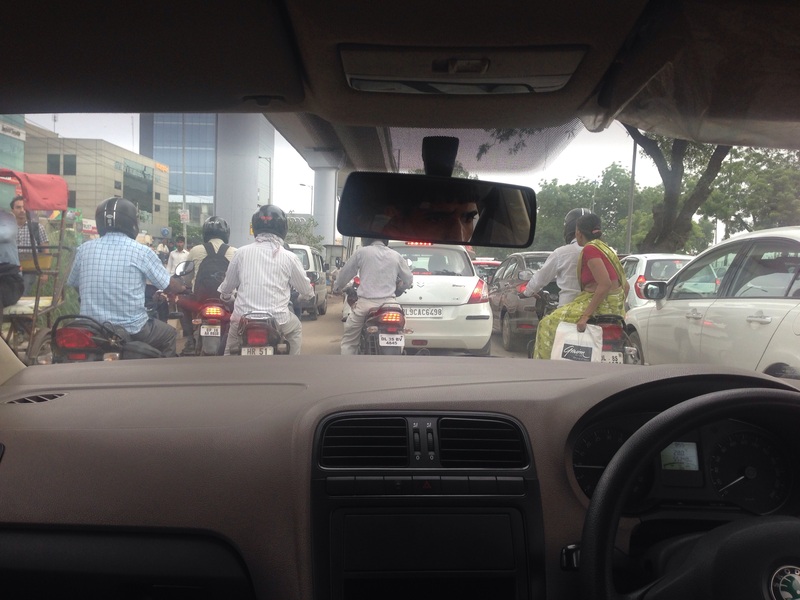 A view from Inside our hired car with driver. After yesterday’s fail in trying to submit our visa applications for Myanmar we had booked the car and driver once more and hit the road early to ensure we made the 10:00am opening to for the embassy office. We arrived right on time and were second in line and had all our paperwork ready to go. We confidently handed the applications over and within a minute had the bank cheque handed back stating it would not be accepted as the diligent embassy official kindly pointed out that the word “Myanmar” was incorrectly spelt (Mayanmar). After yesterday’s efforts to lodge our applications and then again today being rejected for such a beurocratic reason both Steve and I tried to reason with the official. Reasoning did not work…….. “Bank fault, bank must fix, not my fault” was pretty much the only response we were offered. So it was then a mad rush to find another bank that would issue a cheque with the correct spelling. Thanks to some good old fashioned Delhi driving and both Steve and I firmly strapped in the back seat of the car, we soon had the cheque and returned to submit our paperwork with a few minutes to spare before the office shut. We now hoped that when we return tomorrow that the visas would be granted ok.
On the way back to the hotel it also meant an additional trip to the issuing bank to get our first cheque refunded. Thankfully that went smoothly. We manged to make it back to the hotel with enough time to drop the bikes off at the BMW dealer and for them to start work on them. Steve headed back to the hotel to research our next journey leg while I stayed with the bikes to oversee the work being carried out. Steve’s bike was first and all went well including having the damaged pannier from a couple of days earlier being repaired. We manged to have the bike sorted and done on the day. Sorted! Today was to be a busy day as we had several items to attend to including submitting our visa applications for Myanmar as soon as possible. Hangin outside the Myanmar Consulate, New Delhi, but it was shut! Fortunetly The Vibe Hotel where we were staying offered a late model hire car with driver for only $36US a full day which worked out a treat when having to navigate Delhi. 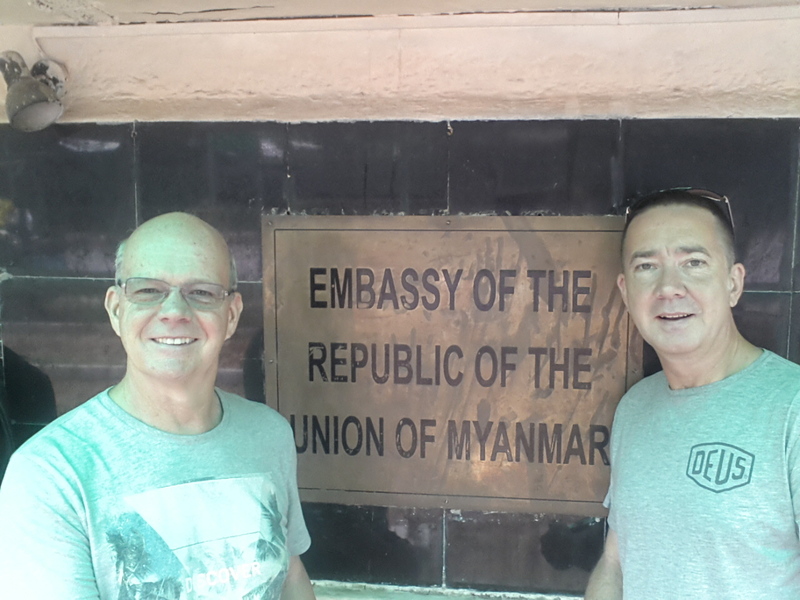 First we were off to the Myanmar consulate to submit our visa applications. First problem for the day occurs as the visa office is only open between 10:00am & 11:00am daily (despite the website saying all day) and we arrived at 11:40am! It would not have been so bad but due to the traffic and location it was a two hour drive each way. We checked with the guards what we would need for tomorrow and off we went. Next stop was to visit a camping store as my camel back bladder had failed recently and Steve required a new bag and a top. We were fortunate the driver knew his way around and although we had to use an interpreter via his mobile phone to discuss anything. We were soon at a great little camping store and we were able to get what we wanted. Next we had a break for food which involved making a quick run from the car to the shop due to the monsoon rain occurring. After lunch it was off to a bank nearby our hotel to obtain a bank cheque for the visa applications. The first bank had a fault with their printer so we then drove another 15km (each way) to another bank that would provide a cheque. 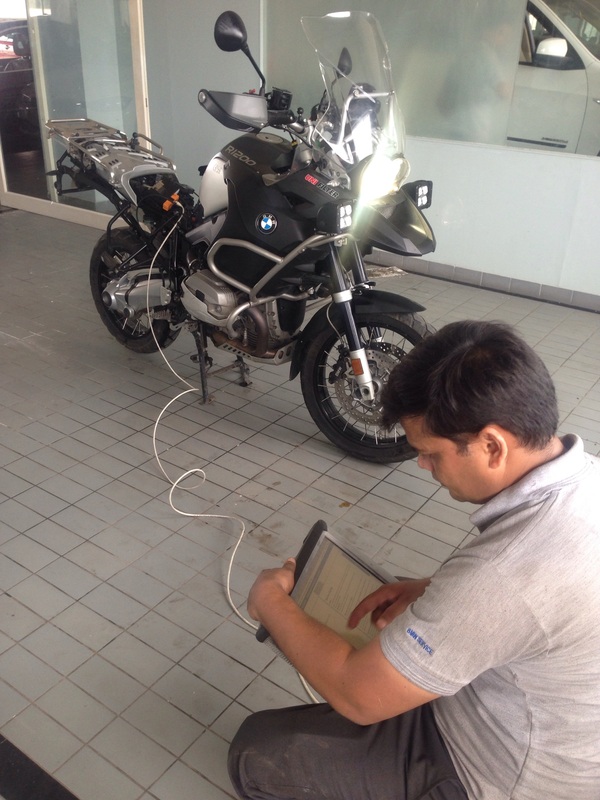 More on the cheque later but for now it was time to introduce ourselves to the service department of the BMW dealer where we were to get our bikes serviced as they had traveled 14,750kms since last having a spanner on them. It was great to meet the people I had been emailing some 6 months earlier as part of the preparations for our Mad Ride. We were hoping the tyres I had being shipped from Mumbai (I had pre shipped them there as tyres are not available in India) had not arrived yet. A BIG shout out to Shyam Narayanan who is my Great work colleague back at Suncorp in Sydney who assisted greatly with his cousin in Mumbai to have the tyres shipped. Thanks loads! We arranged to drop the bikes off tomorrow and hopefully the tyres would be in by then? We had achieved most of what we wanted but it was going to be a case of heading back to the Myanmar consulate tomorrow to have another go at submitting our visa’s. 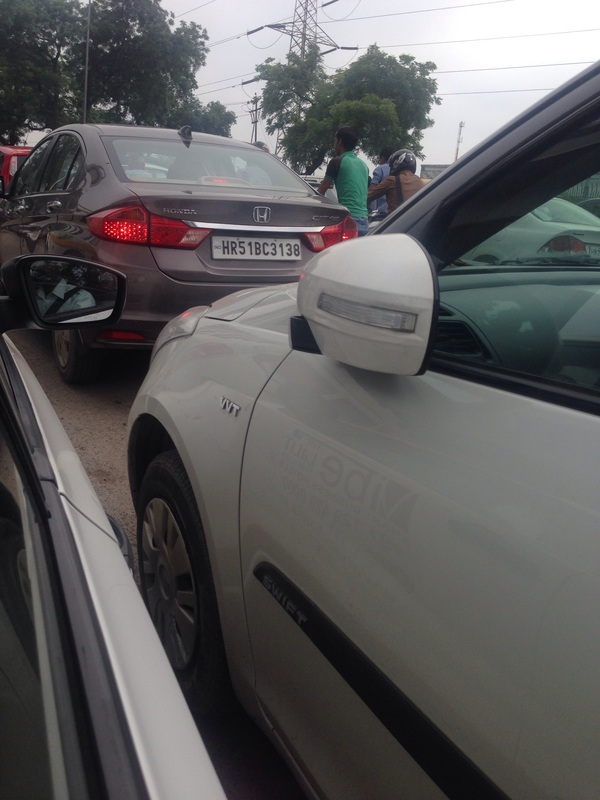 No this is not a parking lot, it’s typical Delhi traffic, note the folded back mirrors. Who needs them? 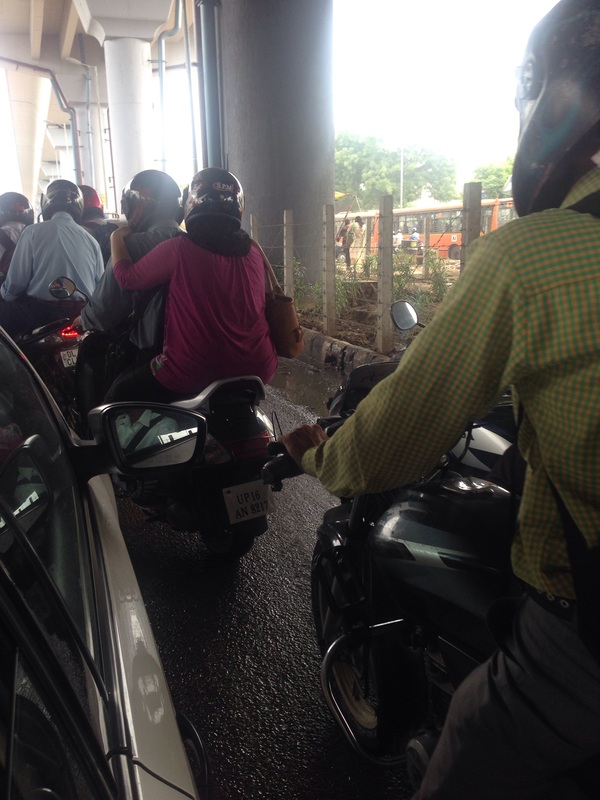 The ride today was from Amritsar to New Delhi, a distance of 518km. As we progressed it involved passing through smallller townships which were very hectic and crowed at times. Unfortunetly Steve had an incident with 2 buses as he passed one, another tried to squeeze by in the opposite direction resulting in him being clipped by a bus on his left hand side damaging his pannier which required a bit of roadside repairs. Fortunately Syeve did not go down and was all ok. The roads finally opened up into a more significant route making the progress ok until we go to the last 50km which took 2hrs due to significant Delhi traffic. 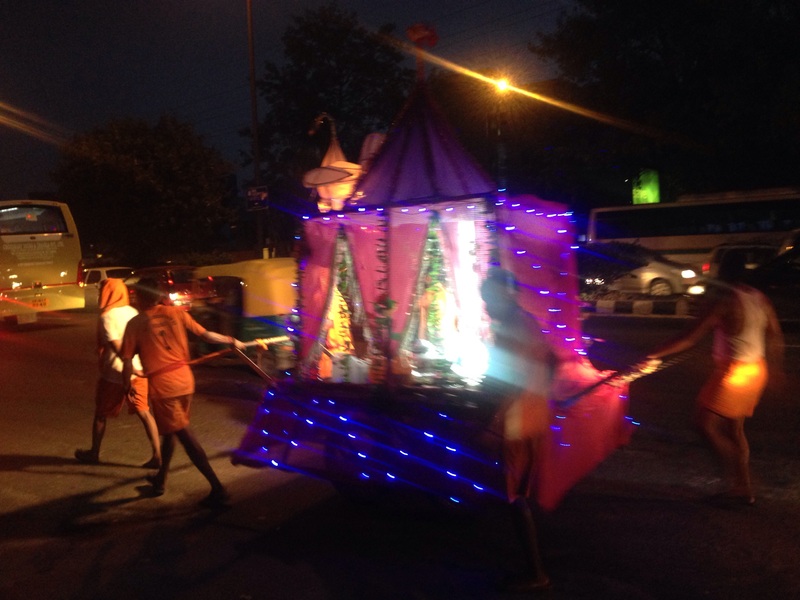 This traffic was compounded by the start of a 7 day Hindu festival in which devotees walked along the roadside with support vehicles and music playing which through the already bad traffic into chaos. 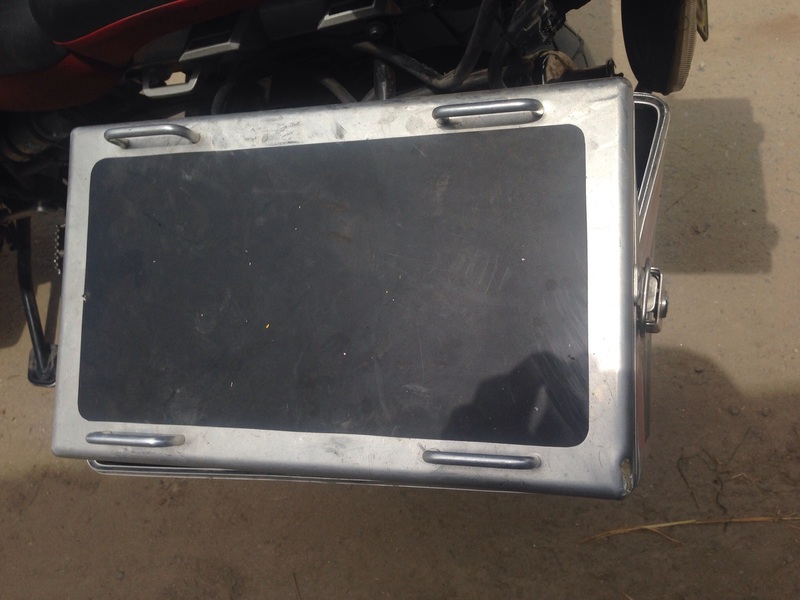 Unfortunetly due to the design of our BMW motorbikes being air cooled they required forward motion to have air passing over them to contain the temperature. The result of the traffic jams for an extended period meant we were forced to park up the bikes on several occasions and allow them to cool before progressing. Not what you want after a long ride in very hot and humid conditions. 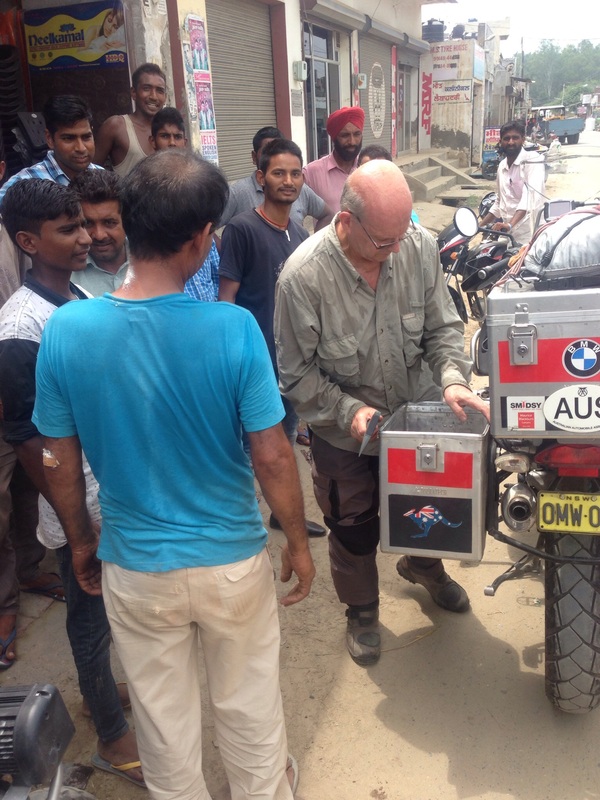 Steve with a huge audience while he repairs his pannier box. We finally made it to our destination which was located on the Southern side of New Delhi as we have an appointment with the BMW dealer to have the bikes serviced in the coming day(s). 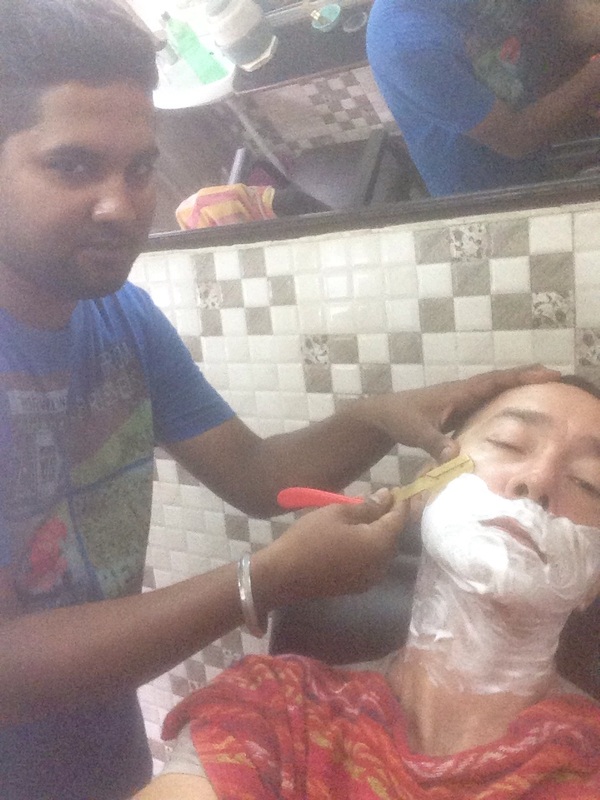 Today was a slow day, chilled out and I took time to have a hair cut, shave and head and shoulder massage at a traditional barber. Highly recommend all the blokes out there taking the opportunity to experience this if you visit India. The process took about 1 1/2hrs and you feel great after. The rest of the day was taking up with discussing where to travel in India with a couple of other guests at the hotel we were staying at and also bidding farewell to our German friends Ralf and Yin who were off towards Bangladesh and then onto China by train and bus! We wish them well. After our arduous journey through Pakistan it was time to stop for a couple of days to rest and do all the house work so to speak. 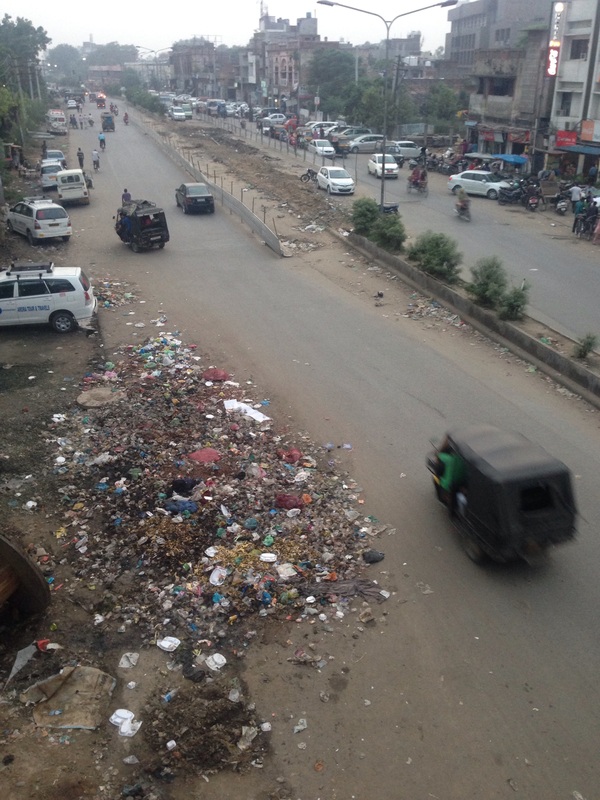 Amritsar is a relaxed and pleasant town compared to where we had come. After organising our riding gear and clothing to be washed it was time to get out and explore and went shopping with Ralf and Yin to buy a few bits and pieces. Adding to the fun was having all 4 of us piling into one Tuk Tuk. We managed to find a descent coffee which was the first in many weeks. Steve was happy as he found an additional SD card he had looking for recently. Later in the day the four of us had orangised a guide to drive us to several sites around Amritsar. First we were off to Hindu Temple which was a bit like a maze that you would find at a fun park, except with various reliquary related shrines located around the outer section of the temple and a large open area where the disciples would congregate for worship. We were then off to witness the evening closing ceremony of the “Wagah” Indian/Pakistan boarder crossing which has been a practice dating back to 1959. Basically it is an Indian/Pakistan version of the New Zealand Haka But with automatic rifles and a bit more Bollywood to it. It was great to watch but interestingly Ralf our German friend witnessed a different side as he could see similarities between this and the bad days of the Nazi’s due to the hyping of the crowds who were chanting negative cries to the Pakistani’s the other side of the boarder. This certainly did detract from the cerimony and certainly does nothing to improve relationships between the two countries. After the Wagah show it was off to to visit the Golden Temple which we were advised is best viewed by night. As with al these significant temples we have visited throughout our Mad Ride the size was staggering and effort put into building was impressive to say the least. Something we find ironic when there is extreme poverty all around. The temple we were told had approx 750kg of gold leaf covering the roof and various parts of the building. The water area in front of the Temple that people were bathing in as there are meant to be healing properties in the water. Our driver left us at the temple which allowed us time to explore and have dinner at a local Indian restaurant which is always fun and a bit of a gamble with your tummy. The evening ended with a Tuk Tuk ride back to the hotel. All in all a pretty good day site seeing.